Choosing the right painters and decorators in London to help you beautify your home can feel like an overwhelming task, particularly if this is the first time that you will be hiring someone to help you with your home improvement project. You may have many questions that need to be answered, so where do you start, then? What are the things you should look for, and what are the things you have to watch out for? Who can you trust to provide you the best value for your money and provide you a quality job? 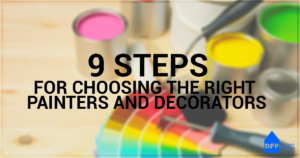 To take the guesswork out of the equation, here are the 9 simple steps to help you choose the right painters and decorators in London that can do a job well done. When searching for a decorator and painter for your upcoming decorating project, it will always be a wise idea to work with a professional. Choose someone who is suitably qualified and skilled to carry out the task and bring your home improvement project to life. Many people consider decorating and painting as a straightforward job that doesn’t need a specialist. This is why they decide to do things on their own or hire someone who is either not knowledgeable or skilled. Skill and knowledge are important to elements to include, to ensure that your painting and decorating job will provide top notch, end results. Think of how you would seek the help of a qualified gas engineer when your boiler breaks down all of a sudden. The same logic applies to painting and decorating as you need to have a complete understanding of the materials you will work with and how you can get high quality finish. As the adage goes, “The finish is in the detail”. A big part of painting and decorating jobs deals with preparation, in which 80% of the time is spent on preparing the surfaces. Another great way to find the suitable painters and decorators in London for your next decorating project is to read and browse online reviews. This will allow you to see what other people are saying about specific painters and decorators and the quality of their work. Ask for personal recommendations from your family or friends who worked with specific painters and decorators in the past for their home improvement projects. You’ll be able to see the standard of their work first hand. Before you can get a quote from painting and decorating contractors, they should first conduct a personal visit to your home to determine the scope of work needed, offer advice, and discuss your preferences. When they don’t ask for a visit to your business or home, this is a red flag that tells you to look somewhere else. Once the home visit is finished, they will then give you a written quotation which will clearly describe the work that will be done. When selecting which painters and decorators to work with, you should always look at previous work they’ve done by looking at photographs of previous jobs they have carried out. Alongside with reviews, this should give a good idea of what they can do and quality of the work and customer care. When choosing the right painters and decorators price plays a role, but too often price dictates who is employed and who is not. A very important aspect to take in to account when selecting the right painters and decorators for your home improvement project is to take in to account their customer care skills throughout and upon completion of the project. This may increase the price but overall you can be assured that they will deal with all aspects of your home improvement project and produce high quality work. When it comes to painting and decorating projects, the choice of materials is equally as important as choosing the right painting and decorating contractors to carry out the work. We would recommend you select materials that are well known for their quality. Painting and decorating contractors experience in this aspect is vital and so we would advise you take their advice on board to obtain a high quality finish for your painting and decorating project. One final point to take in to account when selecting the right painting and decorating contractors for your home improvement project is to work with contractors who can see your vision of how you want your home to look. Do they understand what you are trying to achieve? Choosing the right painters and decorators in London doesn’t have to be difficult as long as you work with professionals, read online reviews, ask for recommendations, schedule a home visit, request a quote, view their work, focus on customer care, use good quality materials and work with professionals who can see your vision.